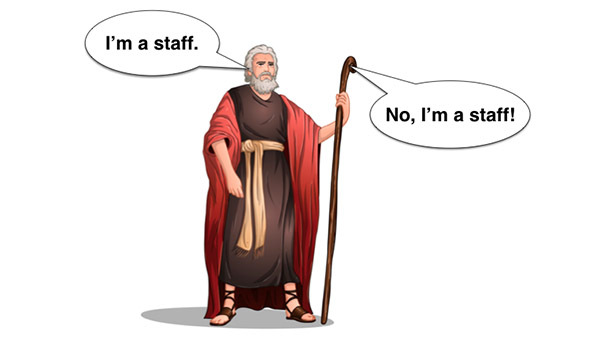 You are NOT a staff! I am a staff at the Ministry of Religious Affairs. Although you will occasionally find an example of staff as a countable noun, it is extremely rare. Staff at the Ministry of Religious Affairs receive a competitive salary. He used his staff to scare away evil spirits and then used it to turn my horse into a brand new Ferrari. I noticed the staff also helped him to walk! In the context of your writing one of these meanings, staff countable / staff uncountable, will probably be more obvious than the other. However, if you want a high score in IELTS for vocabulary, I suggest you choose the most appropriate meaning! I am a member of staff at the Ministry of Religious Affairs. Hi Steve, what about “I am on the staff of the Ministry of Religious Affairs.”? Omg! Got this wrong all the time! Thanks, Steve. could i say: i am a staff member at the Ministry of Religious Affairs? You could. Although I would be somewhat surprised! Hehe..